Part Used & Method for Pharmaceutical Preparations: The aerial parts of the plant are gathered in the early autumn when the plant begins to flower. Then it is cut into pieces and dried. 1. The beginning of warm febrile disease manifested as fever, headache and sore throat. Green chiretta (Chuanxinlian) is used with Honeysuckle flower (Jinyinhua), Platycodon root (Jiegeng) and Arctium fruit (Niubangzi). 2. Heat in the lungs manifested as cough and asthma or cough with yellow sputum. Green chiretta (Chuanxinlian) is used with Houttuynia (Yuxingcao), Platycodon root (Jiegeng) and Trichosanthes fruit (Gualou). 3. Dysentery due to dampness and heat. Green chiretta (Chuanxinlian) is used with Portulaca (Machixian). 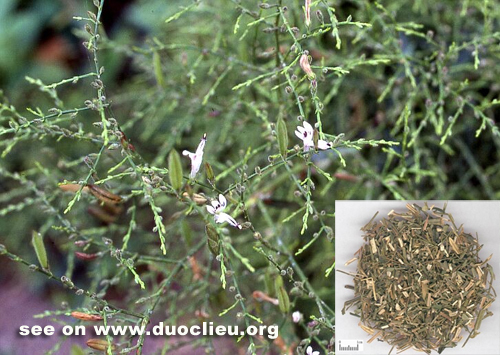 Cautions & Contraindications: Prolonged overdosing of this herb may impair stomach qi.